I have a soft spot in my heart for anti-humanism. - Wisdom is the retention of innocence through adversity. I have a soft spot in my heart for anti-humanism. 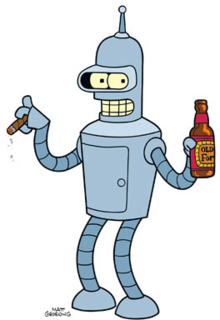 Bender is the Official Mascot of madman102 - which is close enough. What a bender is? A bender is NOW if apple cider counts. "A binge drinking spree". Read more. https://en.wikipedia.org/wiki/Binge_drinking - (Post insipid by st_martin_a).